UNIPORT 2018/2019 Post UTME Form | Cut off mark and Registration Guide. If you are searching for ‘UNIPORT Post UTME Admission Form for 2018‘ This page is all you need. Explore. The management of University of Port Harcourt, UNIPORT wishes to notify all aspiring candidate that the Post UTME admission form for University of Port Harcourt 2018/2019 has been released. Interested applicant should follow the lead below for successful application. UNIPORT post UTME minimum cut-off mark is 180 for all department. ONLINE REGISTRATION – Wednesday, 4th July, 2018 – Sunday, 22nd July, 2018. 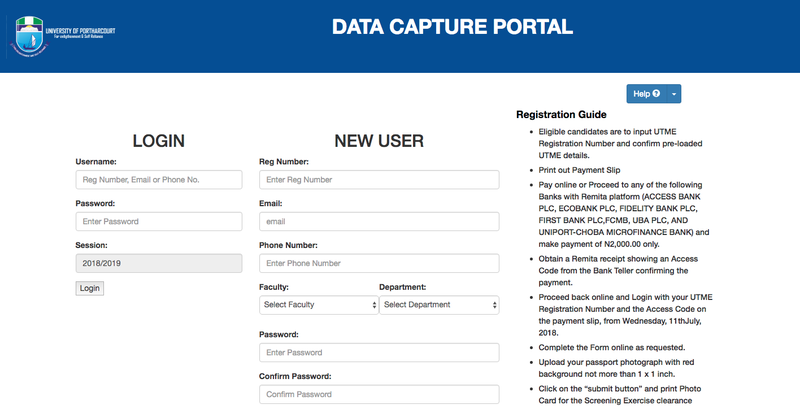 How to Obtain UNIPORT Post UTME Form. Eligible candidates are to input UTME Registration Number and confirm pre-loaded UTME details. Proceed to any of the following Banks with Remita platform(ACCESS BANK PLC, ECOBANK PLC, FIDELITY BANK PLC, FIRST BANK PLC,FCMB, UBA PLC, AND UNIPORT-CHOBA MICROFINANCE BANK) and make payment of N2,000.00 only. Proceed back online and Login with your UTME Registration Number and the Access Code on the payment slip, from Wednesday, 11thJuly, 2018. UNIPORT Post UTME Screening Exercise Schedule. Materials Needed for UNIPORT Post UTME Screening Exercise. Candidates must be at least sixteen (16) years of age by October, 2018 to be eligible for the exercise. Candidates must apply within the Registration period as the online link for the Application Form will be disabled at MID-NIGHT ON SUNDAY, 22NDJULY, 2018. For further enquiries, please call any of the following numbers: 08091153162, 08185945712, 08175125591.